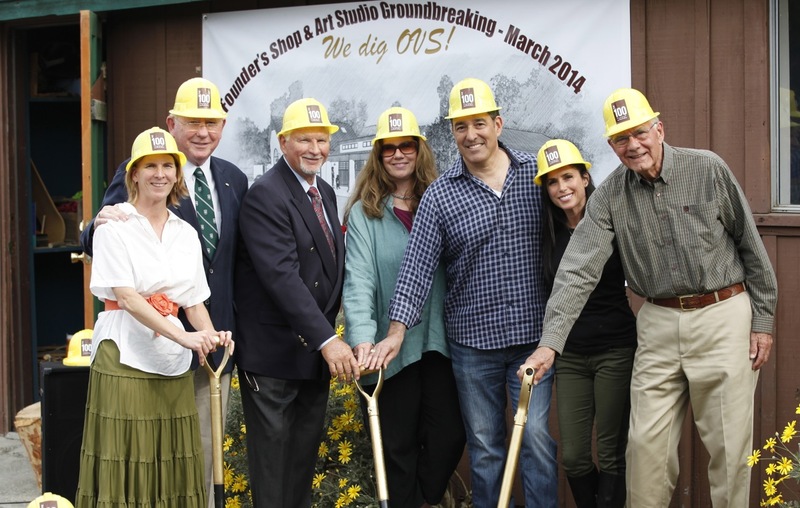 Ojai Valley School has officially broken ground on the restoration of its historic Founder’s Shop, the first step toward a significant renovation of art and woodworking facilities at the Lower Campus that will take place in the coming months. Donning bright yellow hardhats, students and school leaders dug shovels into the ground outside the Founder’s Shop on Saturday and thanked supporters, whose $1.5 million in contributions have made the long-awaited restoration a reality. Built in 1924, the Founder’s Shop has been an iconic building for generations of OVS students who have learned to measure, cut, build, and shape countless wood projects under the guidance of teachers who emphasized the importance of hands-on learning. School founder Edward Yeomans served as the first shop teacher, and the building is named for him. 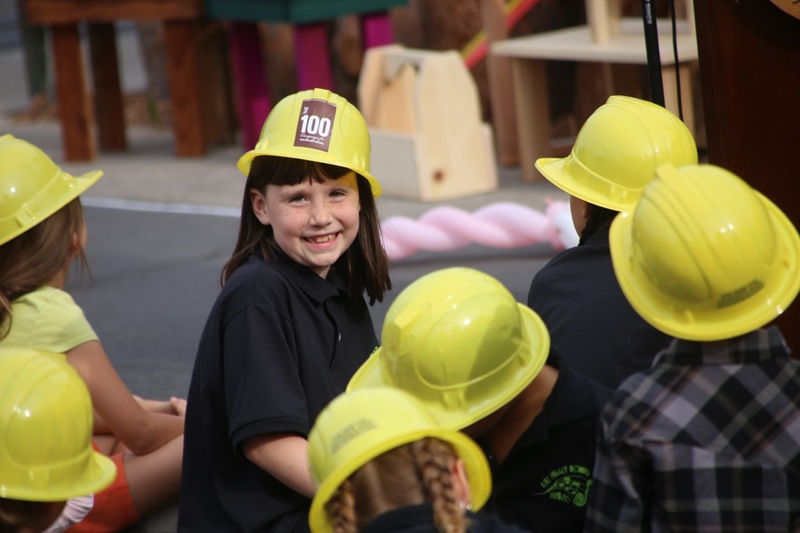 Committed to preserving the woodshop’s historic integrity, the school launched The Next 100 Campaign to fund restoration of the original 732-square-foot building, as well as expansion of the school’s fine arts facilities for elementary and middle school students. Hall-Mounsey said the project would be the first in the city to meet green-building standards established by the Collaborative for High Performance Schools, continuing the school’s commitment to sustainability. He stressed that great care would be taken to preserve distinctive features of the historic building, such as the chimney, bat-and-board exterior, and small paneled windows that face the center of campus. At the same time, the school will more than double its fine arts space to include a spacious art and ceramics studio, an outdoor patio and covered porch, and state-of-the-art technology, including 3-D printers and scanners. “Edward Yeomans would be proud that we are, once again, pioneers in education,” said Karen Morse, Head of School at Lower Campus. “Integrating the arts with applied mathematics, engineering, and digital fabrication technology helps students think multi-dimensionally and furthers our efforts to create leaders in a changing world. Ojai Valley School will begin construction in the coming weeks, starting with a careful dismantling of the building’s historic features and a deliberate effort to salvage more than 75% of the demolition debris. This is one aspect of the green-building standards of the Collaborative for High Performance Schools, a national program aimed at promoting energy efficiency and environmentally sustainable building practices. “It’s an ideal opportunity to provide leadership in the community regarding sustainable building practices and to teach our students about the value of recycling and renewable energy,” said Mac Lojowsky, Director of Facilities and Grounds. Current parents of three children at the Lower Campus, Missy and Eric Stoen have played a key role in the campaign for the Founder’s Shop restoration. Last year they created a dollar-for-dollar match to support the restoration effort with the $50,000 Stoen Family Challenge. “The new founders workshop is wonderful because it will provide our teachers with a state-of-the-art facility in which to pass on their passion for discovery, and inspire creativity in our children,” Missy Stoen said after the groundbreaking. During Saturday’s ceremony, Hall-Mounsey thanked alumni donors Marcia Binns (L38), Michael Eddy (L59), and Alan Pearson (L55), who all attended Lower Campus and provided significant lead gifts from their estates. Hall-Mounsey also gave a special recognition to campaign Co-Chairs Andy and Lorie Helman, and OVS Trustees Liz Hermes (L66, U69), David Trudeau, Ron Rose (L50), and Missy Stoen, who were all present for Saturday’s event. The school is continuing to fund raise in support of the project, and announced a buy-a-brick fundraiser in which all donors who contribute, or have previously contributed, at least $1,000 will be recognized on commemorative bricks in a designated area of the courtyard of the new building. For more information about the campaign, please contact Will Wyman, Director of Development and Alumni Relations, at (805) 646-1423 for details.